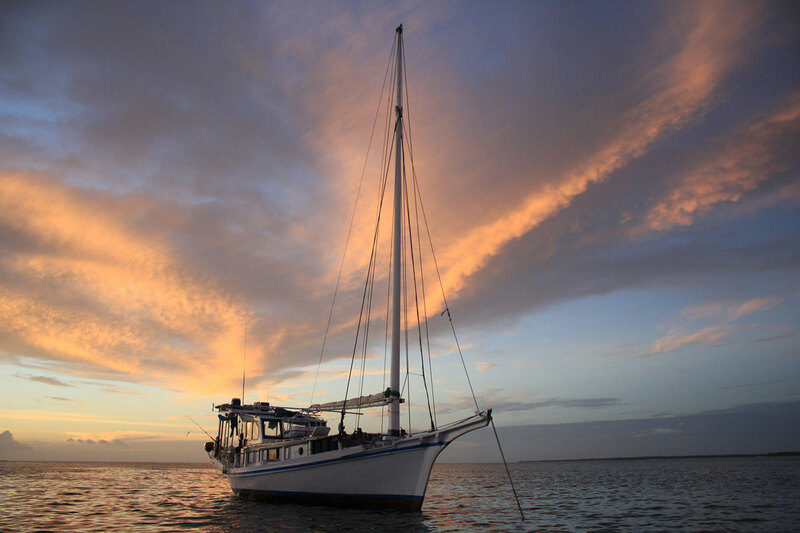 Our Indo Surf Charter Sri Noa Noa is a legendary, graceful 46ft long Phinisi boat. Phinisi boat building is a traditional craft in Indonesia. This massive land of 17.508 islands is surrounded by the Indian Ocean, the Pacific Ocean and the South Chinese Sea. No suprise, Indonesia is one of the big seafarer nations. Combined with the abundant artistic skills of the Indonesian People and the richness of local wood supply, Phinisi boats are a class for themselves with some very distinct features. 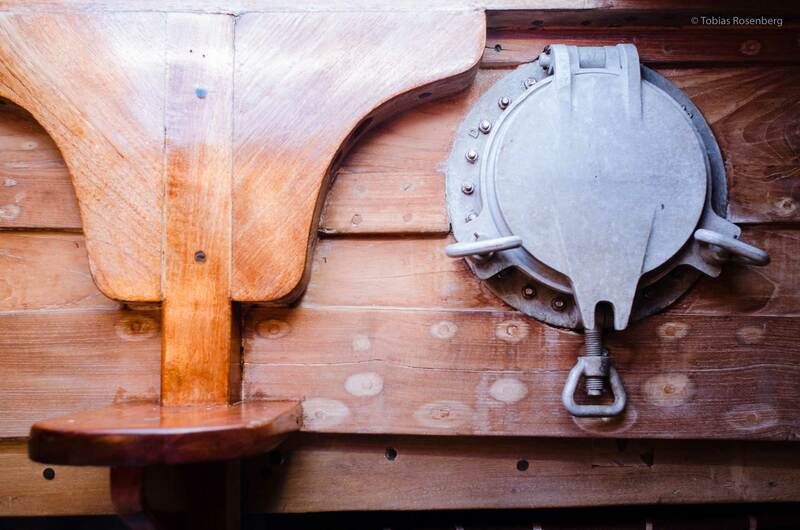 The hull is often made of teak and iron wood which gives the boat that classy, cozy feel. Our shallow draft is perfectly suited for anchoring in these flat-bottomed bays with crystal clear waters. records on board if you want to read more about the old days. Join us and see it yourself! Years later, in 1991, Sri Noa Noa was anchoring in Bali / Benoa Harbor for a few days. 2 surfers were lolling around in the harbor, fantasizing about how to score empty waves in more remote places. They then pledged the crew to join for a trip. Firstly, the captain’s answer was a bit grumpy as they say. But somehow these 2 surfers managed to convince him. And the trip was a success, empty waves and good vibes. 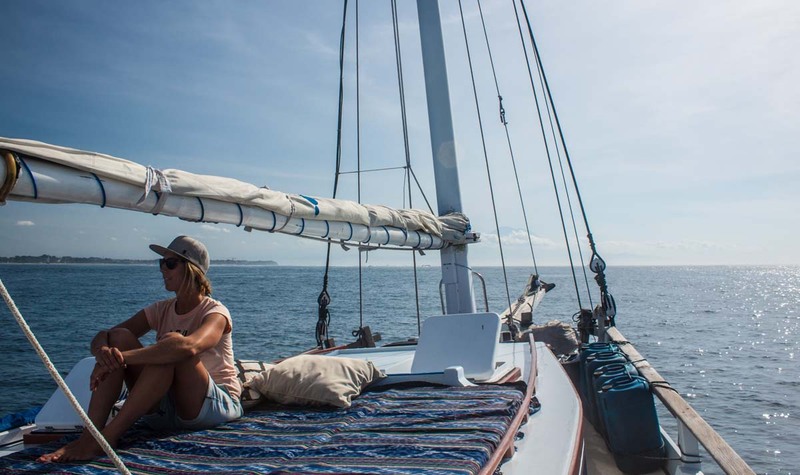 As it turned out, Sri Noa Noa was a perfect base for such "chartered" surf boat trips: The comforts and style of traveling aboard, plus the small size with a maximum of 6 guests is ideal to escape on a fair budget and surf with a few friends only. No insta crowding, a surfers dream come true. As a consequence, this was not the last "surf charter trip", Sri Noa Noa found her new purpose! In the years to come, Sri Noa Noa did explore the surf around Bali, Lembongan, Lombok Sumbawa, Sumba and Rote with many happy surfers aboard, from all over the world. The old lady has quite some stories to tell. Traveling Indonesia in surf style! These pioneering surfing times are golden memories in the 20th century. In the meantime, Bali experienced an incredible growth in tourism. Simultaneously, the amount of surfers increased. Too much, probably. However, you can still avoid the crowds of Bali and escape with us to the glorious east, to these far flung islands with empty, uncrowded waves. Trust us and join us on our mission to surf and explore east of Bali. As soon as we enter more remote regions, we still have that classic feel, again, this pioneering spirit that Philippe must have felt in 1977. In some corners, everything still is mostly unchartered terrain and exotic cultures! This exactly makes the Eastern Indonesian Islands such as Sumba, Rote and even further away secrets a wild dream come true for surfers on the search for uncrowded waves. We have been surfing in these areas for many many years now, but it still feels like very much the same. Nothing changed too much over here. We came with a small group of friends years ago, to surf uncrowded waves. And we still do basically the same thing, surfing here with our friends and family only. It was aboard the Sri Noa Noa in 1993 that big wave legend Mike Miller and friends discovered and named the right at Terimbang, now better known as Miller's Right. Over all those years, we had quite some prominent surfing legends on board, such as world champion Layney Beachley, Joey Cabell, Ken Bradshaw, Samantha Cornish and many more. What is more, Sri Noa Noa is not a secret any longer among surfing musicians: Legends such as Krist Novoselic - bass guitarist from Nirvana - had a lifetime trip on Sri Noa Noa and US punk rockers NOFX came onboard our old lady for some days of surfing Lombok and Sumbawa after they had a gig in Denpasar. Last but not least, we had the family of Jack Johnson aboard, all together sharing some laughs, tunes and many, many waves. Terima kasih, satu ombak lagi! We hope to welcome you on board as well one day, please do not hesitate to contact us, as we book well in advance (check the schedule, but plan about 10 months in advance). Day and night, ocean views! The boat and the captain really can tell stories for a lifetime, we do not want to bore you online with all the details. If interested, you should come on board and find out yourself about the tales of THE classic surf charter boat in Indonesia. However, let us give you a rough idea of what to expect on Sri Noa Noa these days: While we still offer the original route of Lembongan, Lombok and West Sumbawa, some of the breaks are getting more and more crowded. The flexibility of our boat still allows us to surf other bays close by, but you should be aware that there are a lof of land-based surf camps nowadays around this area. For beginners, however, it still is a very good destination! Our favorite surf charter routes nowadays venture a bit further East where we surf some of the most remote corners of Indonesia, mainly Sumba and Rote but, occsasionally, we also do expeditions over to Java, Lombok and Sumbawa. Always on the search! Cozy feel - all teak woods! Our Classic Indo Surf Charter Sri Noa Noa is refurbished and immaculately maintained. 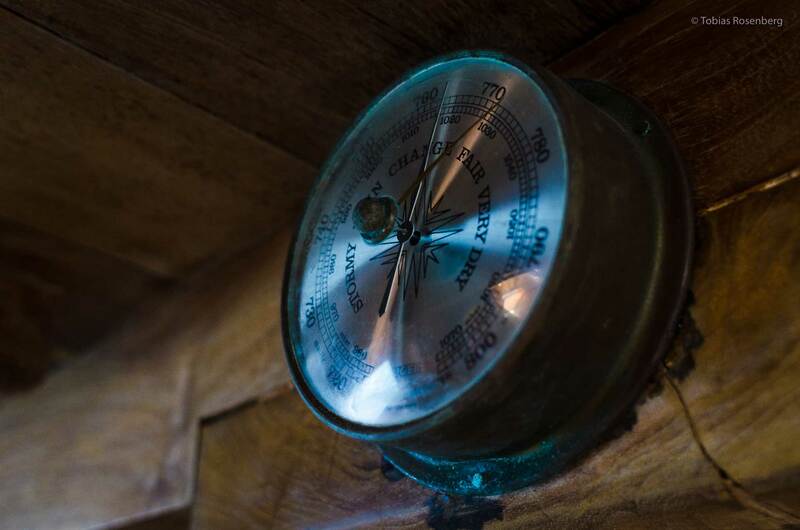 However you still feel all the adventure and history breathing through the old teak wood. In general, we like to keep things simple, Sri Noa Noa is therefore not a luxury boat. 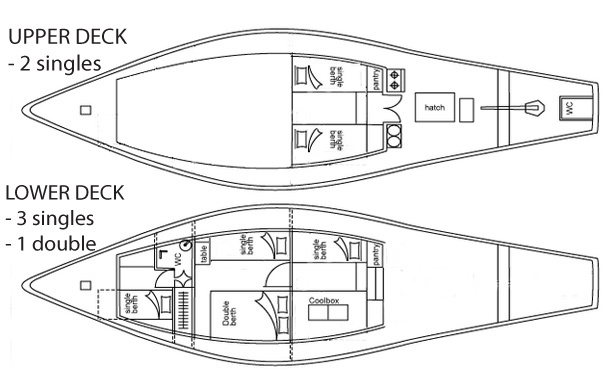 Also, there are other boats which provide more space (some have private cabins for everyone, which Sri Noa Noa does not have on offer for everybody - unless you are up to group of up to 4, then everybody has more privacy). Also, the dining table is still rather rustic these days, most of our guest usually enjoy it this way however and wouldn't want to change it. Bottom line: Instead of unnecessary luxury aboard, we want to make sure you have everything that is really important. For us, this is: Good food, good sleep and low to no crowds. The real luxury of the boat is the intimate service that you will experience. Our small capacity of max. 6 guests but we prefer 3-5 guests for more comfort, combined with your personal crew, makes all the magic. A small group does make a big difference. You'll have your own captain/photographer, mechanic and chef on board. Certainly in good hands! And, again, most importantly - nothing better than surfing with a small group only. This is our kind of luxury! 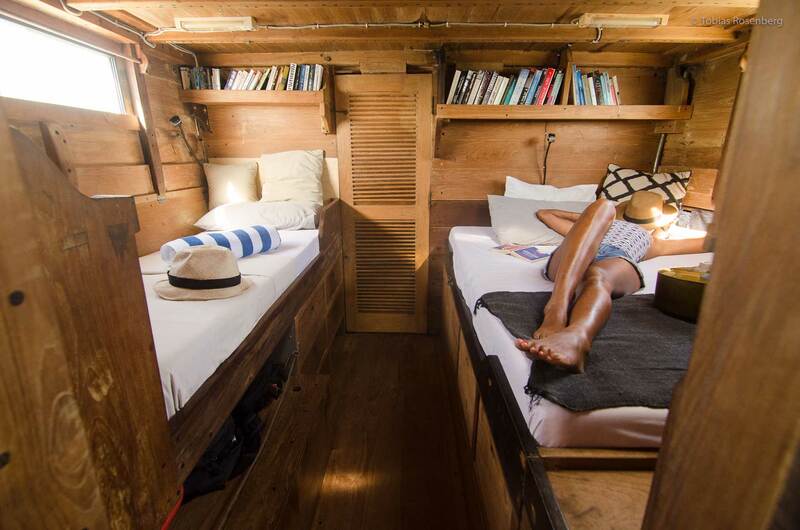 Eat, sleep, surf aboard Sri Noa Noa, cozy teak wood cabins and new matresses! Aboard Sri Noa Noa, we provide new matresses and high-quality sheets & pillows, manufactured with natural fabrics only. Our surf boat has 6 beds (1 queen and 5 singles), a small bathroom and an outdoor kitchen/BBQ. Sri Noa Noa has custom fitted sunbeds with sun shade on the upper deck, so you have plenty of space to chill out with 360 degree ocean views. Our guests relax on it after the surf, still watching the waves, most likely another glorious sunset with a cold Bintang in hand. As each trip on Sri Noa Noa needs some good music, we have Bluetooth speakers and an acoustic guitar on board. Already before the trip, you can check our Sri Noa Noa Tunes on Spotify when looking for some inspiration for good tunes! For the ones that still read proper old-school books we have a nice collection of good books. The snorkeling is awesome in some areas, with crystal clear waters and plenty of colorful fish and we are equipped with good quality snorkeling sets. You love to fish? Sure, let’s catch a tuna or Mahi Mahi - we have great fishing gear (trolling, spinning and spear) on board. Last but not least - our most valuable asset on board really is our experienced and friendly Indonesian crew - friendly service is key for us. 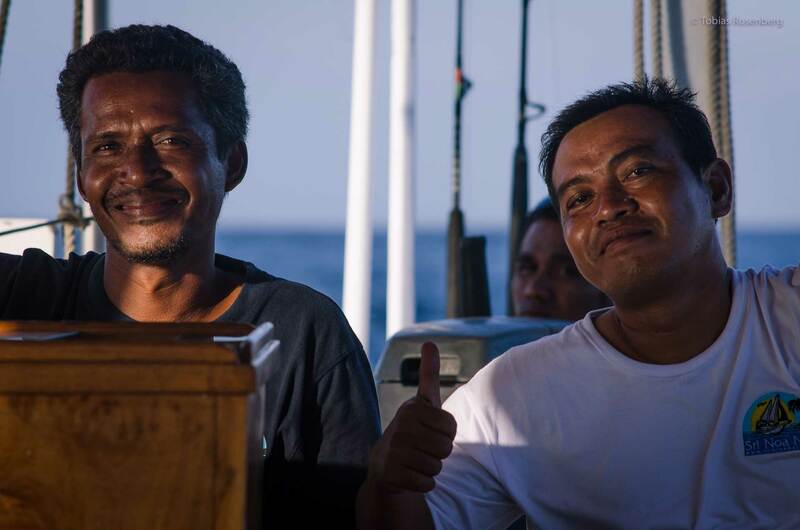 Captain Heri, hailing from Flores, is aboard since 1995, these waters are his backyard. Heri is fluent in English and an accomplished surf photographer. You will be in great and safe hands and guests always rave about him! We are constantly striving to improve your experience on board. Your feedback on our current services or new ideas are always more than welcome. We want to reduce our own footprint while support environmental and social projects in the area. While we already started some initiatives, there is so much more that we could and should do! If you have some good ideas for us, especially on environmental or social topics, we would be happy to listen. Also, if you have expert knowledge in applicable fields, please share. Let's talk and let's do it! Our Captain Heri, on board since 1995! Electric Windlass : Nilsson V 3000. Sound system : Bring your device, we got the speakers! You want to come on board? Just get in touch with us today!